Intel reveals its new 22nm Atom smartphone processors at the Mobile World Congress in Barcelona. 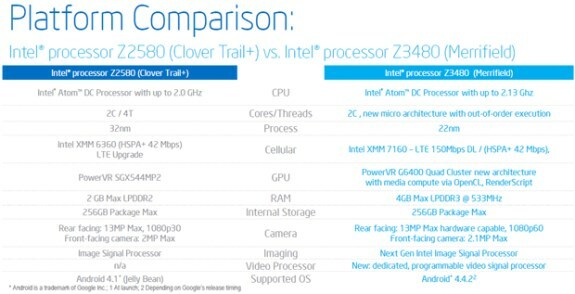 The dual-core Atom Z34 and quad-core Atom Z35, codenamed Merrifield and Moorefield, respectively, are based on the same architecture as the tablet-focused Bay Trail but feature Power VR Series 6 integrated graphics. Full details at The Tech Report. Compared to its predecessor, Merrifield offers a higher peak clock speed, an architecture with out-of-order execution and 64-bit compatibility, faster integrated graphics processor programmable with the OpenCL and RenderScript APIs, support for LPDDR3 memory, an improved image signal processor, and a brand-new video signal processor that supports hardware VP8 encoding and decoding. Not mentioned in the slide above is an integrated "low power sensor solution" that, according to Intel, allows Merrifield to "deliver contextual information to apps with motion & gesture sensing, audio sensing, location sensing and contextual analyses [without] draining the battery." Moorefield is very similar to Merrifield, except that it has two more cores, supports for faster memory, and the ability to drive higher-resolution displays.